I am taking a new medication called Esbriet for Pulmonary Fibrosis. The information packet said that taking Esbriet will not relieve my symptoms. In other words I will not even know I am taking it because it will not take away my shortness of breath. But what it does is work “behind the scenes” in stopping my lungs from worsening. It reminded me of how the Holy Spirit works in us “behind the scenes” building and strengthening providing us with what we need in our daily lives. How even though the “storms” that come our way continue to rage we can and will experience the Peace of Jesus in our hearts. When I think about how Pulmonary Fibrosis is affecting my life it is more important for me to know Esbriet will “arrest” the disease so will not worsen. In a like manner it is more important for me to know the Holy Spirit is hard at work giving me what I need to “weather” the storms that accompany my everyday living. 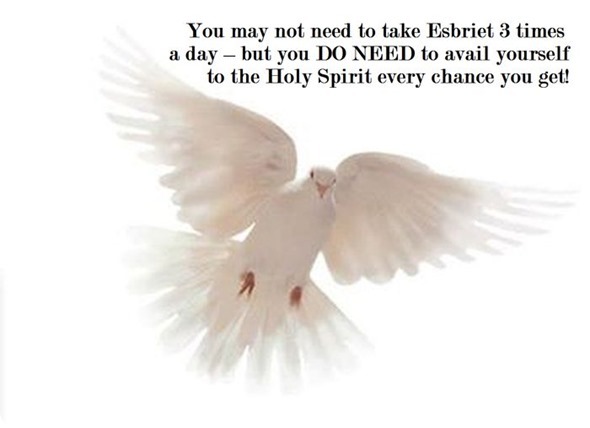 You may not need to take Esbriet 3 times a day – but you DO NEED to avail yourself to the Holy Spirit every chance you get!